The IP57 rating is typically sufficient for consumer electronics such as smartphones, tablets, wearable electronics for watches / fitness equipment, laptops and some medical equipment. In the case of smartphones such as the Samsung Galaxy S4, this has the higher IP67 rating meaning this would be suitable for nearly all non-professional activities. If a truly “ruggedized” phone or tablet is required, the easiest path to getting from IP57 to IP67 is with an accessory case. Please see the links to related article at the bottom for additional information. 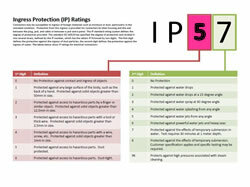 In this case, the IP57 rating meets a minimum NEMA Enclosure rating of 5. Combine travel with work with Desktop-as-a-Service (DaaS) from CloudDesktopOnline.com. If you prefer a server, rent a server at affordable prices from Apps4Rent.com.